Do you need advice, help, support, and guidance for love, relationship, breakup, infidelity, family, job, career, money, moving, and relocation issues and challenges? Then please let Psychic Tarot Expert, Tony Parker help you NOW! 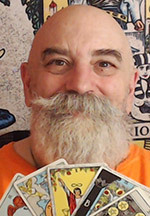 Tony Parker has been giving honest, accurate, clairvoyant, and clairaudient psychic tarot readings with completely accurate time-frames since 1967 (48+ years!). His psychic tarot readings are based on astrological, numerological, qabbalistic, and angelic correspondences & magickal invocations. Tony Parker has been practicing EFT (Emotional Freedom Techniques and Reiki to heal broken hearts and love-pain since 1996. He has also been teaching and coaching "The Law of Attraction" and "The Secret" to help his clients attract and manifest their true love and soul-mate, happiness, prosperity, abundance and success since 1999. Tony Parker really enjoys helping his clients acquire clarity, psychic wisdom, and spiritual healing. His goal is to provide his clients with clarity, spiritual guidance, counselling, instruction and coaching to overcome life's many challenges. Tony Parker is available 7 days a week and he looks forward to the opportunity of being of service to you. Tony Parker is unavailable ... but you can arrange a call back!